Methanotrophs are bacteria that grow on methane as their sole carbon and energy source. A resurgence in interest in these bacteria is occurring, in part due to interest in mitigating methane in the atmosphere as a greenhouse gas (Shindell et al., 2012) and in part due to the abundance and low cost of natural gas and its potential to create liquid value-added products (Stephanopoulos, 2012). The latter processes have the potential to play a role in future energy sustainability. In order to enable research in methanotrophs broadly, a group of methanotroph researchers have donated time and resources to create a Methanotrophy Consortium. You are accessing the first output of this group, the Methanotroph Commons website, a resource of information about methanotrophs freely available to everyone. As the community interested in methanotrophy grows, the resources available will also expand. In this website, we have focused on those bacteria that contain a methane monooxygenase, and are therefore dependent on O2 to oxidize methane. Fig. 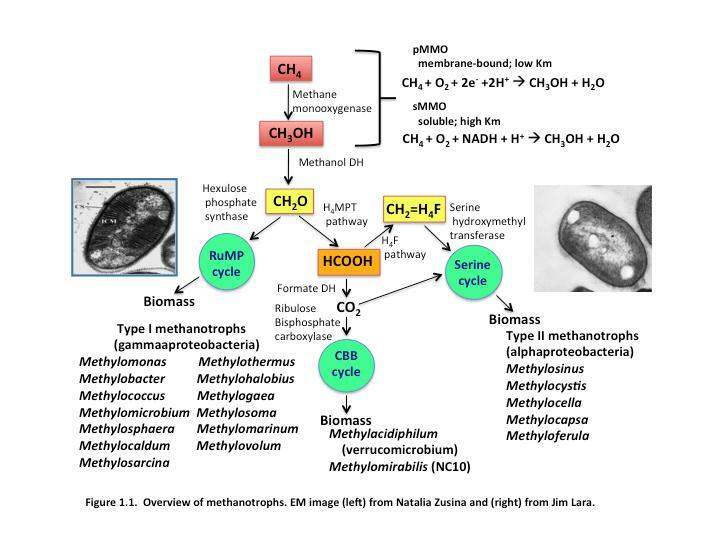 1.1, below, provides an overview of aerobic methanotrophs and their metabolic pathways for utilizing methane. The mission of the Methanotrophy Consortium is to disseminate expertise in methanotrophs in order to enable a resurgence in research on methanotroph biochemistry and physiology and to enable methanotroph commercialization based on growing interest to convert low cost natural gas into value added products. Our goal is to connect existing and new methanotroph laboratories in academics and in companies with each other for both information transfer and recruitment. New to Methanotrophy? Start here! Interested in contributing content or joining the Methanotrophy Consortium?